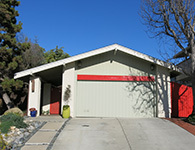 4 bedroom + 3.5 bath + family room home, Mid-Century Modern with a Santa Monica flair. Three bedrooms up, one bedroom down. Downstairs bedroom with full bath also has second entrance from outside, can be used for professional seeing clients, art studio, etc. Kitchen features gas cook top, double electric oven (one convection), built-in microwave (with convection), maple cabinets, and granite counter tops; pass-through to family room aids conversation while cooking. Atrium entry and living room includes vaulted ceilings, combining to give a feeling of space and airiness. Spacious family room includes built-in cherry shelves/cabinets/desk. Hardwood floors throughout the first floor. Fireplaces with gas logs in living room and family room. Drought-tolerant landscaping in front with "Zen" walkway, including decorative fountain, to front door. Solar heated pool in back. Home is connected with FIOS cable. Read about other recent properties. Get a snap-shot of market conditions over the past two quarters - with the focus specifically on Santa Monica real estate. Blogging about Santa Monica real estate. Articles about market conditions, tips, and more. Read updates and ask your own questions here. The MLS - Multiple Listing Service - is the most reliable source of information. Why use anything else? Search here. I live and work here in Santa Monica, and I enjoy introducing buyers to my city - and helping sellers connect with the right buyers. I was the #1 Agent for 2016, 2015, and 2014 in the RE/MAX Santa Monica office and have been consistently in the Top 3 for many years. Because my daughter went to Santa Monica schools from pre-school on up, I know a lot about the school systems, both public and private, and can give Buyers information they may need to make the right choices for their family. The one real estate award that means a lot to me is membership in the RE/MAX Hall of Fame. Copyright © 2010-2018 James A. Brunet. All rights reserved.